Bought a 1/6 barrel for my kegerator. I should preface this review by saying that I was compromising with my wife on something because I wanted her to enjoy it too, as I usually like hop-heavy brews. And she loves it. It's good to me; just not distinctly memorable (although I remember every barrel I try in my kegerator). That being said, it's smooth, like a Belgian Sierra Nevada, so its drinkability is excellent. Served in a Hennepin glass. Hazy orange color with a thick, fluffy white head. Aroma is a combination of hops and Belgian yeast. Mild hoppy flavor up front that becomes sweeter as the drink goes on. Incredibly drinkable beer! I'm hoping this becomes a year-round offering from one of my favorite breweries. Pours a golden color with a big pillowy head which recedes to a tight head and leaves some lacing on the glass. The aroma is spicy with hints of citrus and a nice sweat smell to it. The smell is a little subdued. The taste has a nice yeasty sweetness along with belgian spiciness. In the middle comes a citrus hop bite. The bite is subtle. There is more citrus than hop at the back end. The mouthfeel is moderately carbonated. Overall its a good beer it is mainly spicy and yeasty with hints of other flavors it solid but nothing left me needing more. Served from tap into a Trappe Door tulip. Poured golden yellow-orange with a two finger white head that subsided to a half finger slowly. Maintained phenomenal lacing throughout the glass. The aroma was comprised of sweet malt, banana, fruit, fruit hop, and spice. The flavor was of sweet malt, banana, fruit, fruit hop, spice, earth, and earth hop. It had a light feel on the palate with medium carbonation. Overall this was a fairly decent brew. This was a fair example of the style, but nothing really stood out at all on it to me. I went back a second day and accidently ordered the same brew as I forgot I hadn’t ticked it the day before and immediately got upset with myself. While this one isn’t bad, it just wasn’t my cup of tea as I really wanted something that would wow me. Unfortunately this was not it… Worth trying for yourself to give it a shot, especially if you are a fan of the style. On tap at Citizen Public House in the Fenway. Served in a standard pint glass. Very bright orange-yellow color. Thick white head on top, with some good lacing. Smell has a piney aroma to it. I liked the flavor of this beer a lot. It had a wonderfully light hop flavor that melded well with a splash of sugar sweetness. Mouthfeel was substantial but smooth. Really easy beer to drink. This brew would easily appeal to both the lovers of Belgian ales and Pale Ale devotees. A great offering from Ommegang. Appearance - Golden yellow with a 3+ inch white fomay head and tons of lacing. Smell - Pale malts, belgian yeasts, spices, floral hops, farmhouse/saison aroma. Banana and lemon with some hints of oranges and pineapple. Taste - Very bitter, tart pale malts with the spices and sweet yeasts at first sip. Theres some underlying caramel notes also. Very floral, orange, lemon and banana are a main flavor. Minor warming alcohol at the finish. Mouthfeel - Its light, but theres some bitter sourness that will pucker up mouth at first sip. TOunge gets tons of pale malts, yeast, banana and lemon. Palate gets some sweeter hops, more malts and funky belgian spices. Aftertaste is dry and sour. Overall - Very tasty and enjoyable. Very pale mixed with the spices, adds alot of sweet and sour. One of the cheaper brews ommegang makes, and a good representive of the style. Worth a drink for sure. 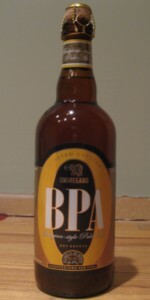 Ommegang BPA...in a bottle...at Resto in NYC. Appearance-a hazy golden orange with an offwhite head that rises and falls, sticking around in the large glass. Smell-spicy hops, bit of wheat, cumin spice, sugar, malt is there but doesn't hold a candle to the rest. Taste/Mouthfeel-medium mouthfeel, peppery spice up front but balanced with notes of orange, cascade hops come through, notes of pine, breaded malt is there, finishes smooth with a peppery finish. Drinkability-balanced flavors no real issues. Overall-well done, a unique beer, not sure it's worth all of the considerable hype it's gotten but Ommegang is continuing to make great beer. Cheers. 12 ounce bottle - $2.69 at Total Wine & More in Kennesaw, Georgia. Appearance: Pours out a clear, orange-gold body with a tall, proud, airy white head. Splotches of sticky lace on the descent. Smell: Rustic whole-grain sour dough bread accented by traces of sweetness and a rich array of spicy, fruity, floral notes. Taste: Bready, coarse-grain maltiness with sweetness hinting at a bit of light caramel as well as a drizzling of basic simple syrup. Next, flavors from both the Ommegang house yeast and American-Slovenian hop mix struggle out competing complexities, giving tastes of pears, lemon peel, acidic grapefruit juice, ground white pepper, cloves, dried herbs, day-old dough, and light underlying cellar-like funk. A generous, though not overblown bitterness is present. Some alcohol warmth bordering the dry, zestful finish. Mouthfeel: Medium-plus body. Medium-high carbonation. It's got that smooth and sticky yet also fizzing on the tongue thing going on. Overall: A nice Belgian-inspired beer where the hops and yeast steal the show. The alcohol is up there, though not entirely disproportionate. Still, I appreciate the 12-ounce portion, instead of having to drain an entire bomber bottle. Estery with a pillow for a bubble cap. Hoppy nose, bottle says, "Cascade." I'll take their word for it. Dry, bitter, metallic and with a bit of raisin on the tongue. "Bottle conditioned", speaks the bottle again. I like that, makes for a nice fluffy bubble. Alcohol seems a bit much at times, but I butch up and deal with it every time. On tap at the blue door. Taste: Wheat, apples, lemon citrus, white wine, honey. Balanced finish, slight pine and floral. Drunkability: Good summer drink, bit too fruity to drink multiples.